Do we have a case of MISTAKEN IDENTITY? For generations, the image of the four horsemen of the apocalypse has captured the imagination of Bible interpreters. Front and centre is the rider on the Black Horse - usually depicted as a mysterious skeletal figure, draped in a black hooded robe, holding out a pair of scales in his thin bony hand, unleashing famine on the earth. But is this picture correct? While researching the meaning of 'barley' in Scripture, D.A. Cleland discovered the rabbinical tradition linking 'barley' to God's deliverance from hunger and death, and His abundant provision. Cleland observed that there is a consistent pattern that is evident not only in the Old Testament but continues throughout the New Testament, leading to the re-evaluation of Revelation 6 in the light of the 'Law of First Mention'. 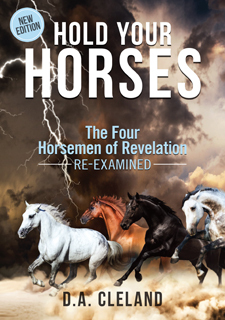 Presented here is a fresh new reading on the four horsemen, drawing on the entire biblical text. Highlighted is the importance of the 'denarius' and the 'balances' which prove to be the two symbols that are the essential keys confirming without a doubt who rides the mysterious Black Horse of Revelation! It is believed that this is the first book published that uses the interpretative approach of the 'Law of First Mention' to ascertain what the symbols of the Four Horsemen of Revelation signify. Visit the author's book website here.